Los Angeles Airport (LAX) is the largest airport in California and millions of passengers pass through its gates every year. One of the world's busiest airports, thousands of flights take off and land annually from Los Angeles International Airport's location on the south coast of California. The city of Los Angeles is just 15 miles (24 kilometers) from LAX Airport and the two are linked by numerous rail and road connections. Within Los Angeles International Airport's nine terminals there is an impressive choice of shops and restaurants, and all the services passengers would expect from a modern international airport. Los Angeles International Airport is the base for millions of passengers to travel to destinations in California, North America and around the world. 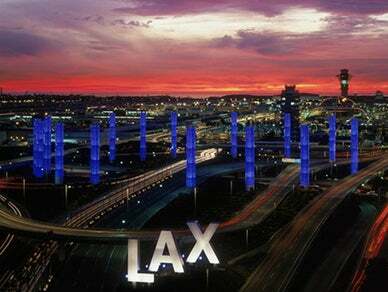 LAX Airport is also a central cargo hub for the Southern California area. RT @LAAirportPD: #LAXTraffic is clear and moving smooth throughout the Central Terminal Area and surrounding roads. Drive safe! @itsmorenamorena @SLAPFISHseafood We are glad that you enjoyed your meal! Have a great trip!